We arrive at school, it has just started to get light outside and the building sounds quiet without all the cars whizzing by outside. We grab our packed lunch and board the coach. 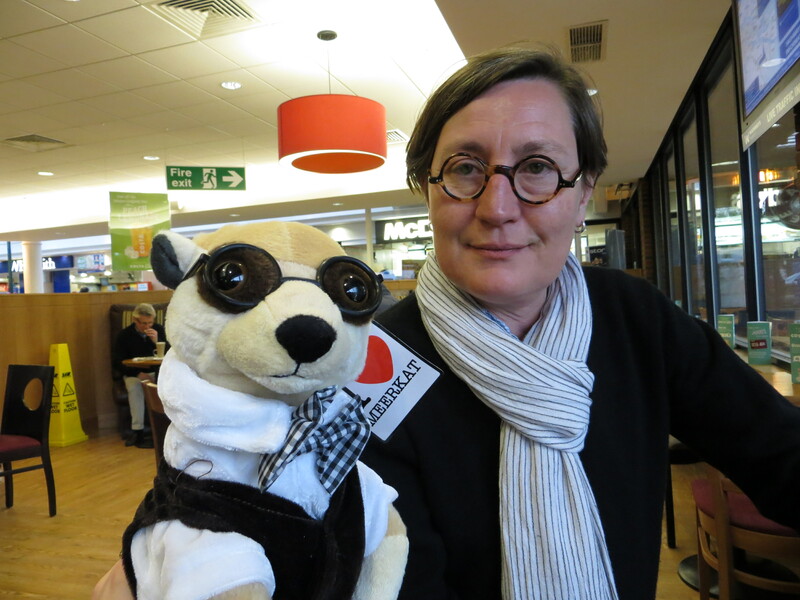 Quick stop at Maidstone services, for breakfast/ a coffee/ a meerkat. Here we pick up our two tour guides, Martin and Roger and get back on the road. We have acquired a new passenger, one that (I am told) bares a likeness to Miss Gremillet. We hope we can get him through the border without a passport! 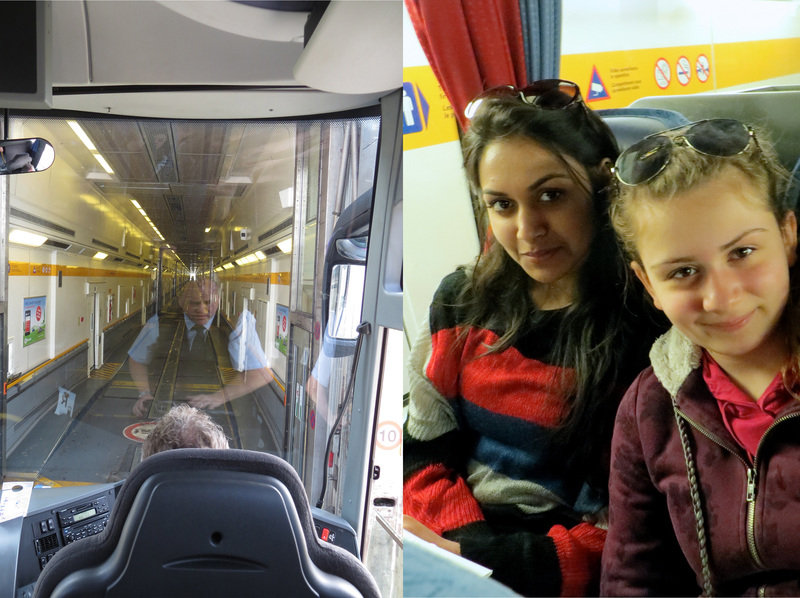 We arrive at the terminal, get through customs and drive onto the shuttle. It feels a bit like being stuck in a tin can and we are glad to be out in the light again when we arrive in France just 40 minutes later. We put our watches forward an hour, it is 10.21am French time. We have been driving to our first destination for almost an hour now and are about to arrive. The views around us are beautiful, luscious green fields are injected with luminous yellow. 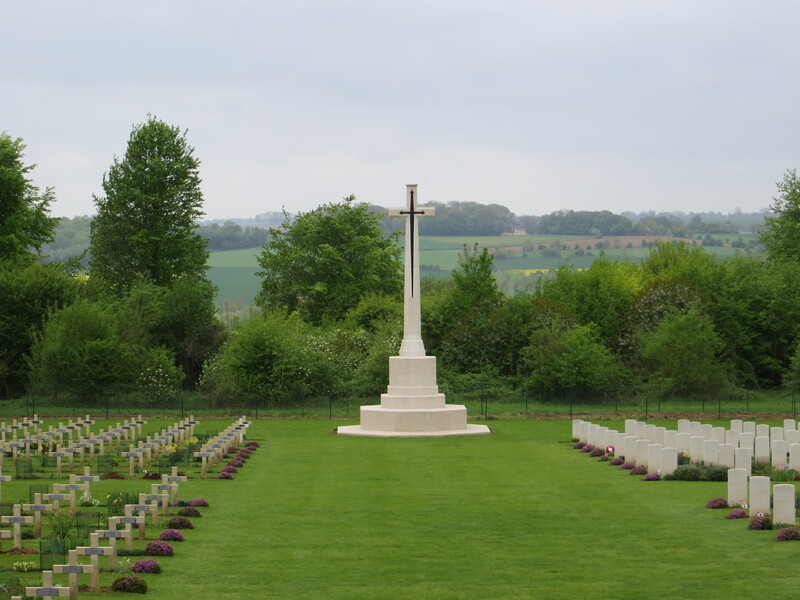 Our first stop is Serre Memorial Park. We hop off the bus and take a moment to look at the hundreds of gravestones in front of us, precisely lined up, row after row. 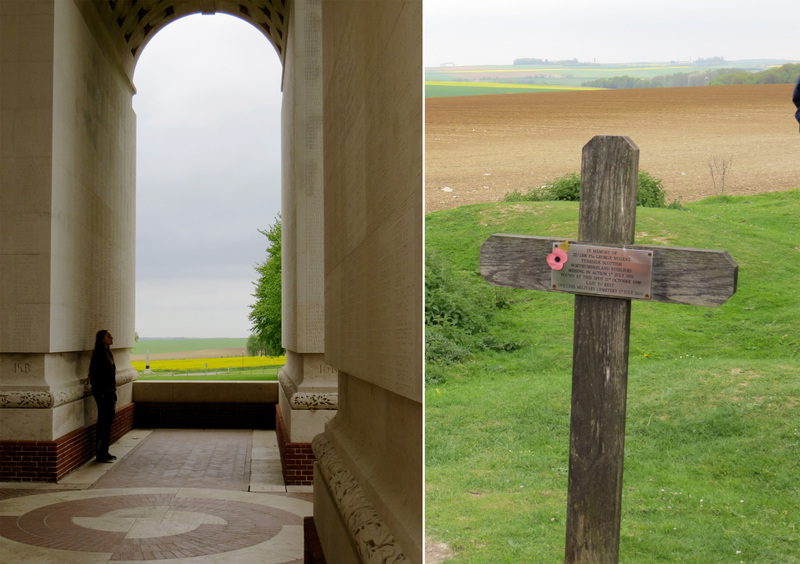 The site is silent, there is nobody else around, we follow our tour guides through the adjacent field – this is where the Battle of the Somme took place. It is starting to pour down with rain, the wind has picked up and the umbrellas are losing the will to live. 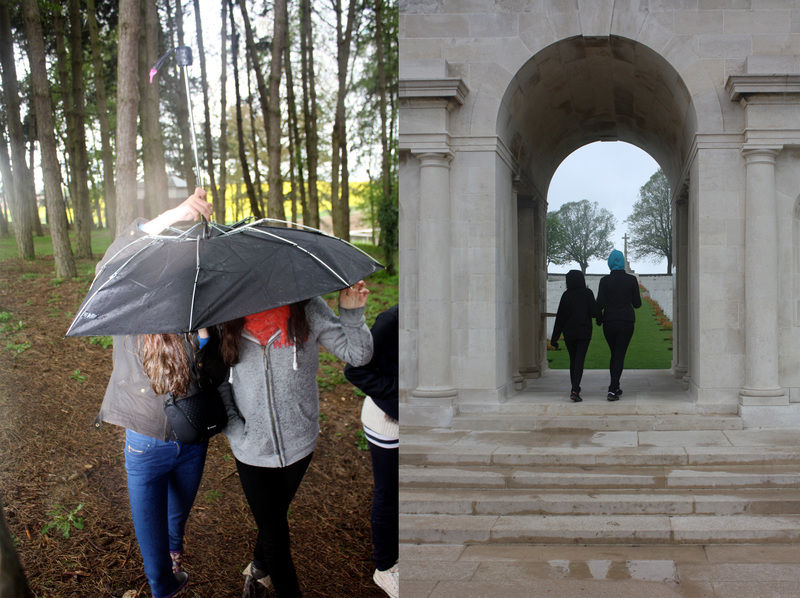 Thankfully the girls are still in high spirits (perhaps buzzing from all those travel sweets) and so we take cover under the trees and huddle round to hear Roger tell us about the Battle of the Somme. 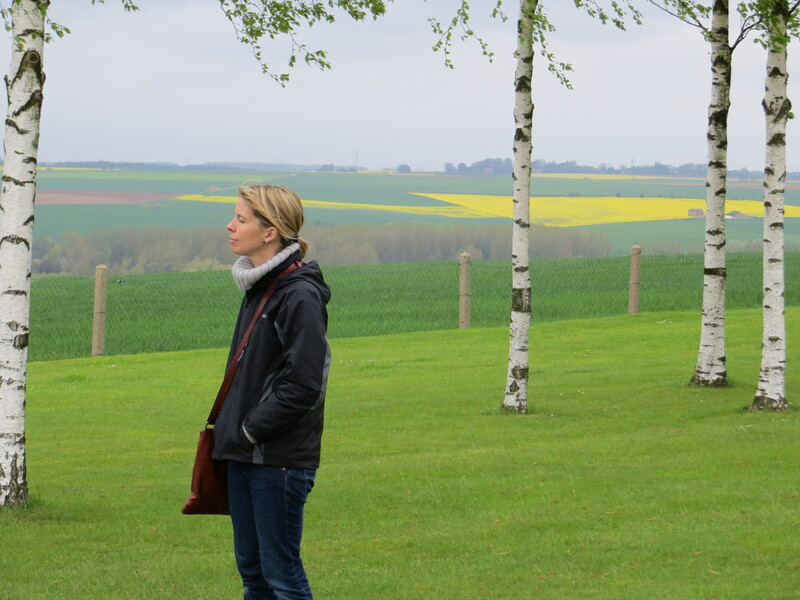 We look out into the field as he tells us how hundreds of men were sent onto the battle field only to be shot seconds later having made it just a few feet from base. Thousands of men were lost that day, the army were unprepared and ill-equipped – many of the bodies are buried around us now. Roger tells us how a million and a half missiles were fired in the first week alone at least a third of them never exploded and still lay scattered around these fields. Next stop is a near by barn surrounded by sheep. Pleased to be under cover for a bit, we sit ourselves down inside and tuck into some lunch. 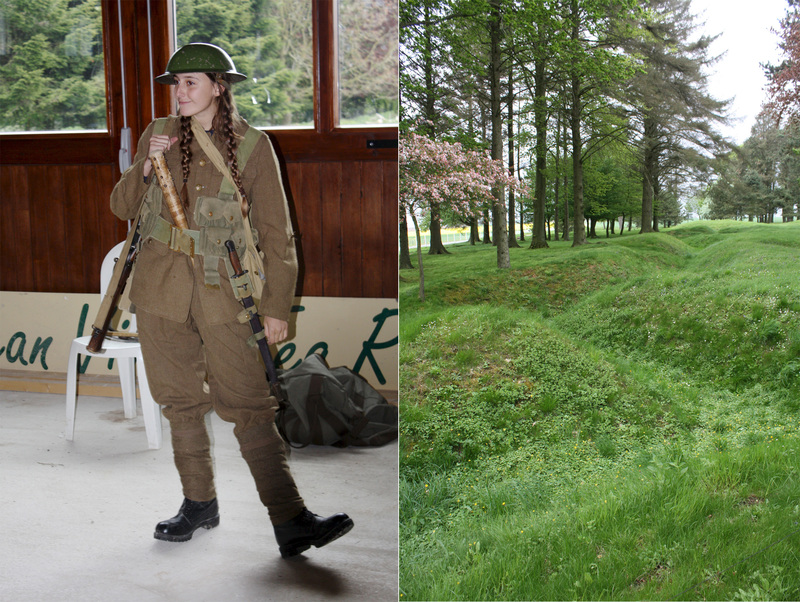 Alaia has bravely volunteered to dress up in a soldiers uniform, we go through each piece of equipment to understand how the soldiers survived at war. 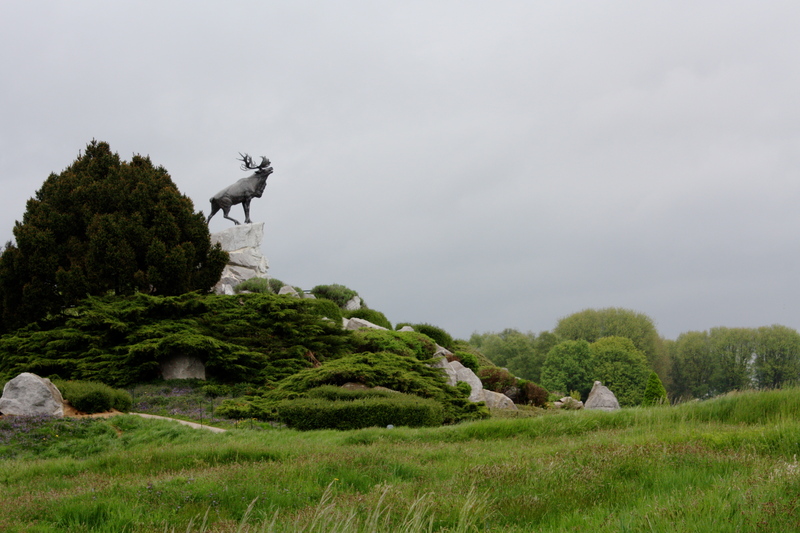 Arrive at Newfoundland Park and walk through trenches that were dug and used during the war. 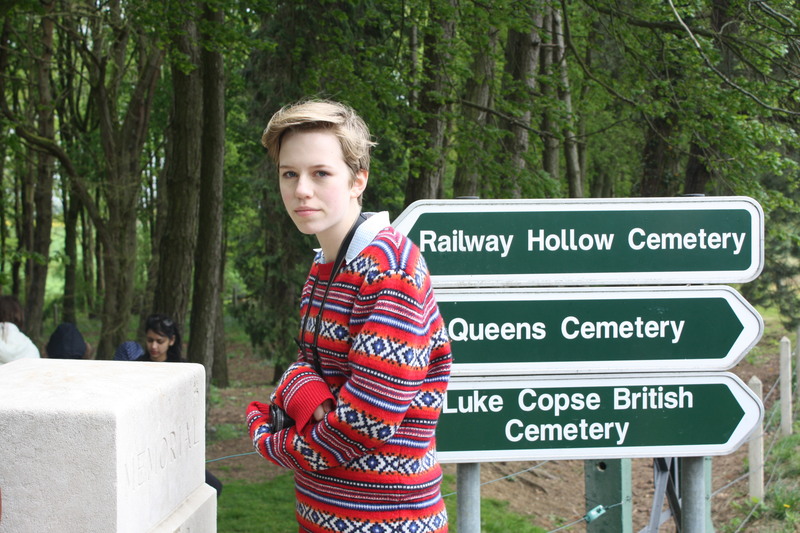 It seems surreal to be walking on the same pathway that the soldiers used all those years ago. A cast iron stag stands on top of a hill, overlooking the field. 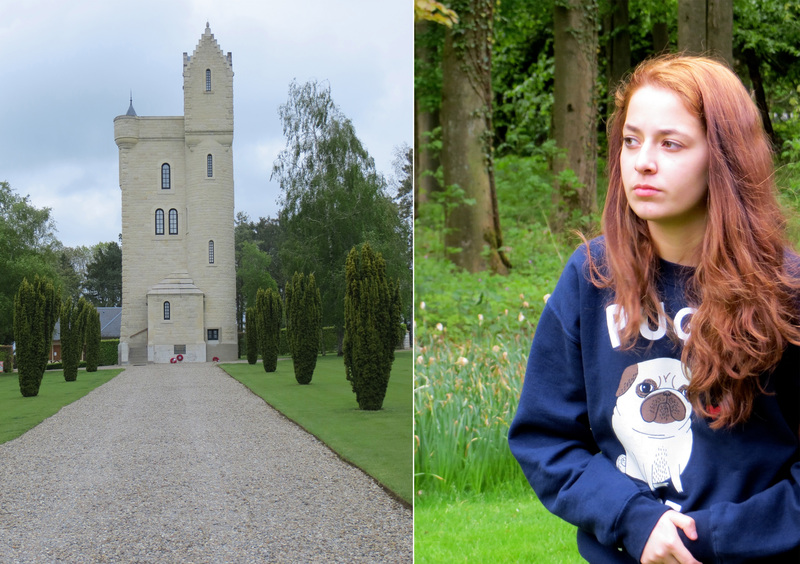 Across the road is Ulster Tower, a grand building stood in a well kept garden. Three flags wave in the sky. We walk around admiring the building and snapping away on our cameras. We stop off at the tearooms before leaving. Hot cups of tea have never tasted so good and warms us up for the afternoon ahead. 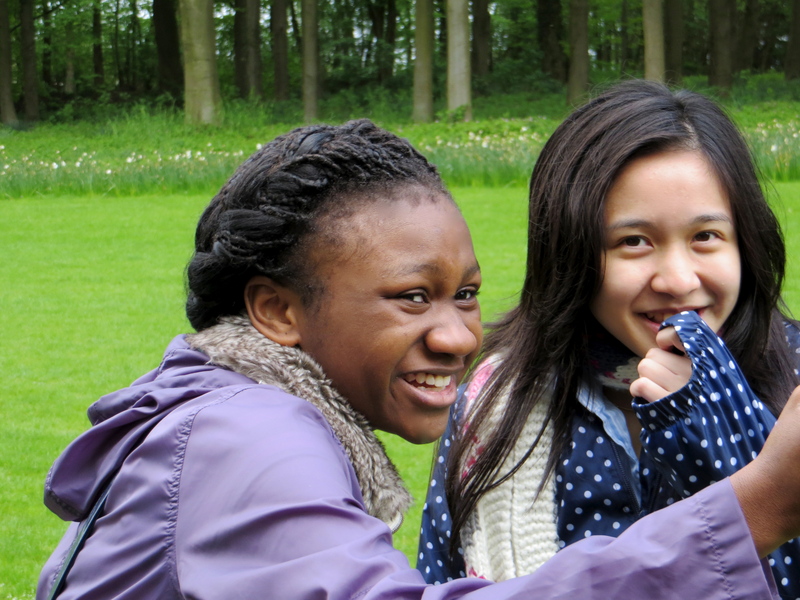 Standing in the queue, damp and shivering some of the girls warm up with…ice cream?! Lochnagar Crater Memorial is our penultimate stop on the trip. 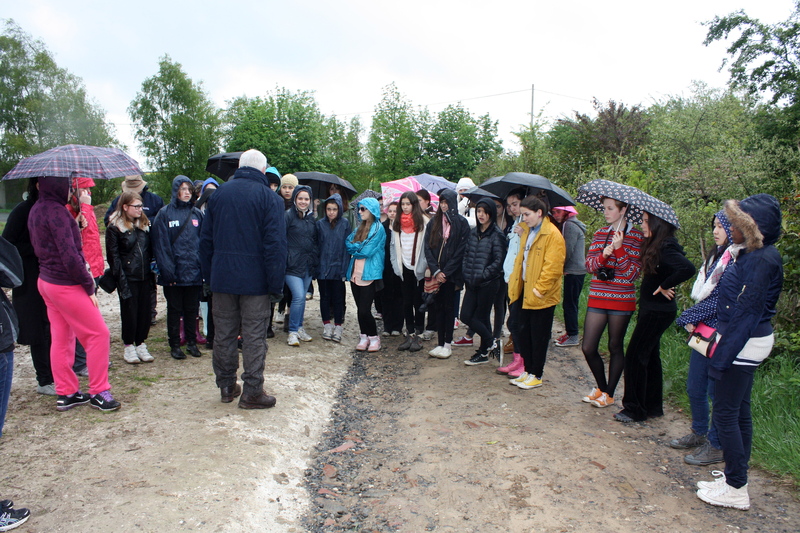 We walk across the ground where soldiers built a secret underground tunnel to get to the village on the other side. The plan seemed ingenious until the Germans sussed their plan and built a joining tunnel leading to the nearby river. The soldiers were flooded and hundreds died in the 4ft tunnel underground. 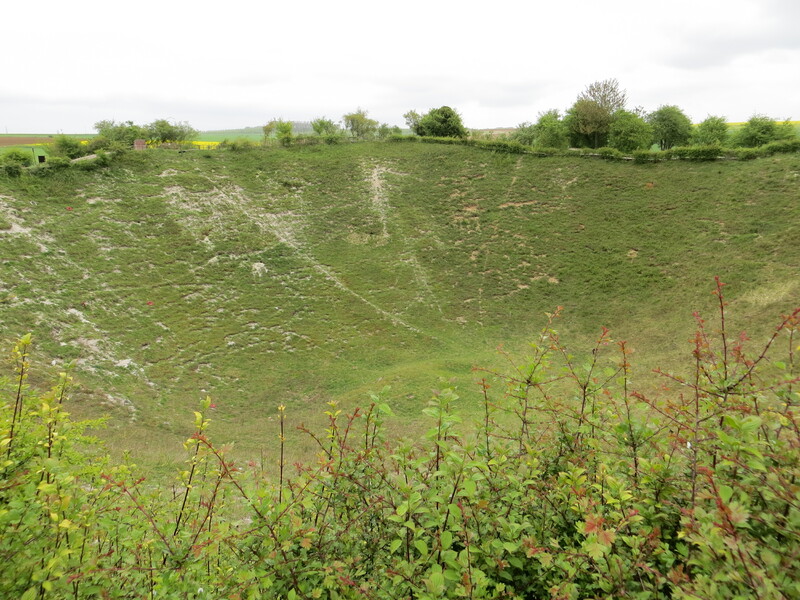 The Crater that gave the memorial its name is a staggering hole in the ground. It is almost like a bowl has been carved into the earth. The bomb that caused this is said to have been heard all the way from london, it killed people living miles away from the scene. 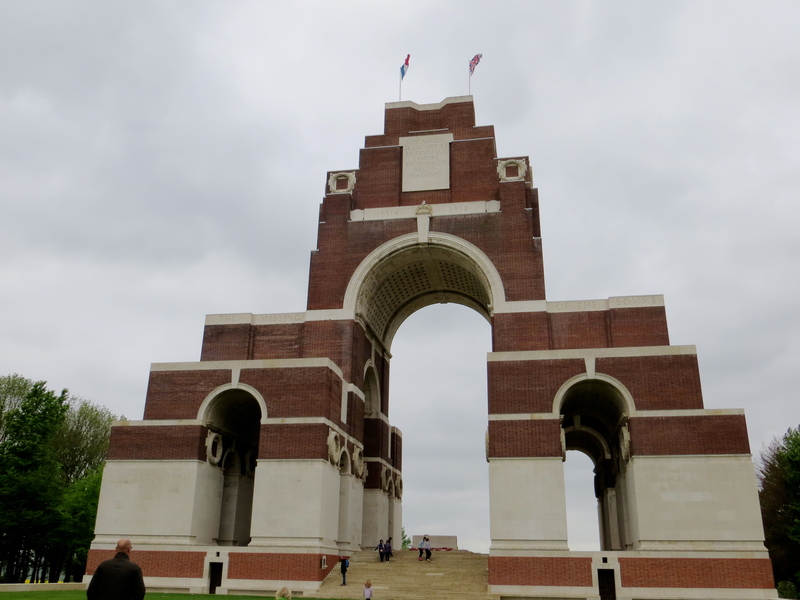 We drive on, and not far away is the Thiepval Memorial to the Missing. The building is huge and very grand. Names of soldiers cover each and every wall. There are thousands of names – this is a time for reflection. Some of the girls have written their thoughts down and take this moment to stand in front of the group to read them aloud. We stand for a minutes silence and lay down a poppy wreath before we leave. We’ve reached our final destination! 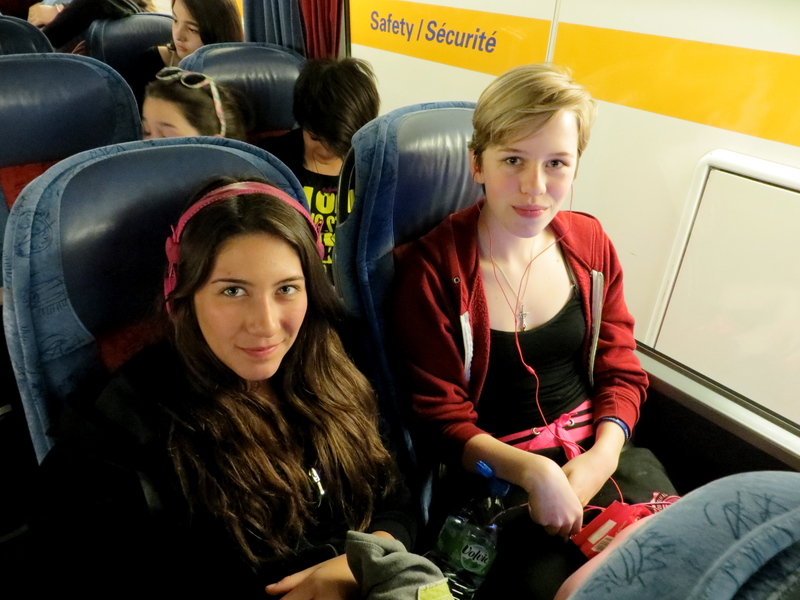 We arrive at the ‘Cite d’Europe’ Shopping Centre armed with euros, eager to explore. We have just 45 minutes here, we grab some food and gather some treats to take home before driving back to the shuttle. On route home. The girls are reading their history booklets quietly and falling asleep…only joking!!! In fact, the girls are more hyper than ever, singing, dancing and excited about the weekend ahead. 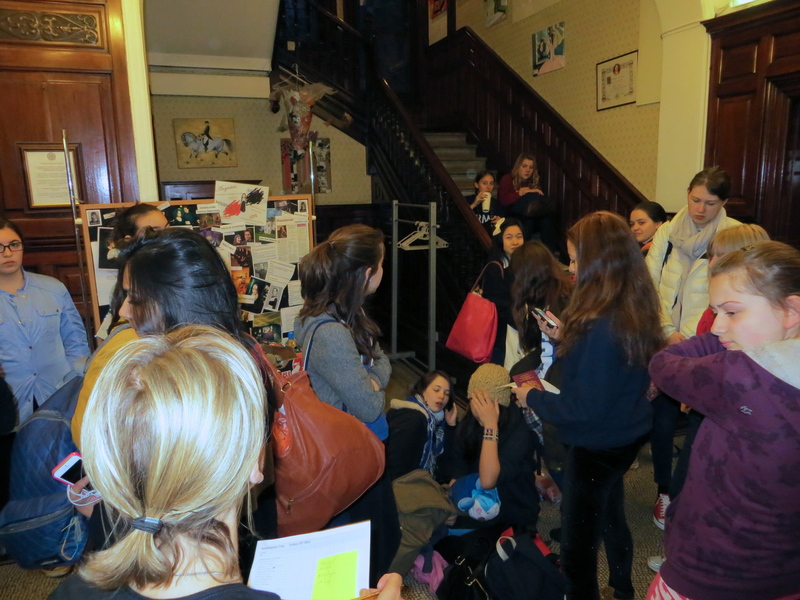 We arrive back at school just shy of midnight, exhausted and ready for bed. Thank goodness we won’t be sleeping in the trenches tonight!